Should we have an enforceable right to food? – Professor Geraldine van Bueren Q.C. People are going hungry in England because England, to the detriment of the poor, has forgotten its legal history. Nearly eight hundred years ago, in 1216 English law first recognized a right to food. Yet between April and September this year over 350,000 people received three days’ emergency food from the Trussell Trust food banks, triple the numbers helped in the same period last year. 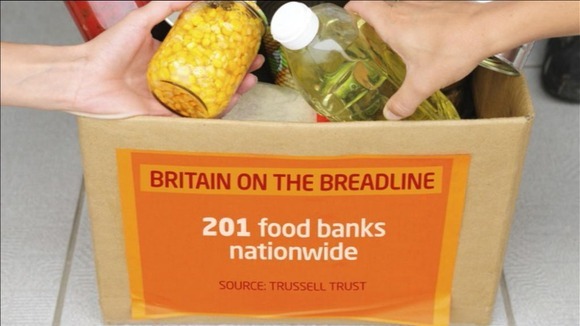 Although justifiable outrage has been expressed at this increasing hunger in 21st century England, such hunger has not been regarded as an issue of human rights law, but only of charity. The United Nations, however, has made clear that the right to adequate food is indivisibly linked to the inherent dignity of the human person and is indispensable for the fulfilment of other human rights. Unknown even to many lawyers, the right to food was first protected in English law in the Charter of the Forest 1216. The Charter of the Forest was regarded as a sister Charter to the Magna Carta adopted only one year earlier. Blackstone regarded both the Charter of the Forests and the Magna Carta as being of equal importance (for a history of British Socio-Economic Rights from 1216 see Van Bueren, “Socio-Economic Rights and a Bill of Rights – An Overlooked British Tradition”, Public Law 2013, 821. Although expressed in the arcane medieval language and concepts of the thirteenth century, the Charter of the Forest recognized rights to the essentials of medieval living. These, rights such as the right to honey, grazing rights and rights to firewood, constituted the essentials of medieval life, but translate in the 21st century into the right to adequate nutrition. The United Kingdom has been legally bound since 20 May 1976 to implement progressively the right to food, according to the United Kingdom’s maximum available resources. The increase in the use of food banks clearly shows the lack of progressive implementation because, at root, it is not a lack of food but a lack of access to available food. According to the International Monetary Fund in April 2013, measuring states’ Gross Domestic Product, the United Kingdom is the world’s eighth richest state. Hence it would be difficult for the United Kingdom to argue that it has expended the maximum available resources to avoiding the necessity for people to use food banks. There are two possible approaches. The first is that it is arguable that the lack of dignity expressed by some users in having to use food banks whilst in paid employment may amount to a breach of Article 3 of the Human Rights Convention prohibiting degrading treatment. This line of argument is far from certain, however, as, despite notable successes, the courts have been hesitant to develop an expansive interpretation of Article 3. The second possibility is using the more direct route calling for the United Kingdom to fulfill its international legal obligations and revive the right to food in the twenty first century. This is not a question of importing foreign rights but of reviving what has been part of English law for hundreds of years. Reviving an English right to food would in practice mean that food banks would once again become unnecessary rather than needed more. As the United Nations International Covenant on Economic, Social and Cultural Rights makes clear, the right to adequate food is realised only when every man, woman and child, alone or in community with others, has physical and economic access at all times to adequate food or means for its procurement. Accessibility is key to this legal right and includes economic accessibility. The UN Committee on Economic, Social and Cultural Rights (“UNCESCR“), the body entrusted with implementing the Covenant, has observed that economic accessibility implies that personal or household financial costs associated with the acquisition of food for an adequate diet should be at a such level that the attainment of other basic needs are not compromised. It is therefore a breach of international law to require people to choose between adequate food or basic winter heating as some people are clearly having to do. The Covenant requires that each State party take whatever steps are necessary to ensure that everyone is free from hunger and as soon as possible can enjoy the right to adequate food. This requires the adoption of a national strategy to ensure food and nutrition security for all, based on human rights principles. It should also identify the resources available to meet the objectives and the most cost-effective way of using them. Nor is austerity a defence. According the UNCESCR, even where a State faces severe resource constraints caused by a process of economic adjustment or recession, measures should be undertaken to ensure that the right to adequate food is especially fulfilled for vulnerable population groups and individuals. Further any person who is a victim of a violation of the right to adequate food should have access to effective judicial or other appropriate remedies at both national and international levels. Such effective remedies are not available in the United Kingdom, both because the United Kingdom has not revived a justiciable right to food and because the UK does not permit those within its jurisdiction to petition the UNCESCR for violations as other countries in the grip of austerity, including Spain and Portugal, have done. The Charter of the Forest’s right to food is as fundamental a right as the Magna Carta’s right to jury trial and both require equal statutory protection. Geraldine Van Bueren QC is Professor of International Human Rights Law and Visiting Fellow at Kellogg College, Oxford. The International Food Security Treaty (IFST) aims to place the human right of freedom from hunger under the protection of enforceable international law, i.e. not just for England but for the whole world. The IFST has been circulating and gathering endorsements from experts in international law, human rights, economics, and hunger, and from political and religious leaders since the early 1990s. The IFST has been scrutinized by experts from different parts of the world on many occasions and has been formally presented at some of the world’s leading schools of law (Yale, Harvard, the University of California), medicine (University of California, San Francisco), and public health programs (Johns Hopkins, New York University), and five times on Capitol Hill in the US for members and staff of Congress and the US delegation to the World Food Summit. The IFST is the subject of an in-depth article in last fall’s “Yale Journal of International Affairs,” which had previously published Tony Blair, Samantha Power, and leading writers and members of the US Cabinet, and may be accessed directly from the home page of the IFST website, http://www.treaty.org. The IFST is due for a major boost in public awareness worldwide in 2014 with the release of “Thunder Head Clearing ” an animated short film on the subject planned for free release on the Internet. As a liberal I find it difficult getting behind the idea of a right to food, as summarised here. It is a lofty and worthy goal to feed all the hungry, and of course this aim should be supported in any practical way. But the rights enumerated in the Charter of the Forest as they relate to this problem are of another era. During this medieval time there were feudal lords and vassals. The vassals were attached to the lords and in exchange for tenancy had a duty to work the land on their behalf and to pay a large portion of the yield along with homage. If times were lean and a lord were to demand that all vassals pay 100% of their yield then the Charter of the Forest would I suppose provide a legal backstop. There was usually an abundance of land and livestock from which to take sustenance. What was lacking then is free will and the opportunity to earn sustenance in whatever manner one could from whomever was willing to exchange for it. I like the idea of the right to grow and harvest whatever one needs in order to survive; however, natural resources are now much more scarce and there is also an element of leading a horse to water. People have to want to provide for themselves. People who are truly starving after economising as far as possible are hopefully inclined to seek aid and are then offered vouchers redeemable in food banks. I would like to think that making use of a food bank in hard times is not seen as an indignity and that this would not put people off. There is no shame in asking for help and I’m glad there is help available. People should never be forced to beg, but I’m inclined to believe that there is no motivation like poverty and hunger to sort out what is truly important in life. If we could all swallow our pride and accept that we must rely on one another when we’ve done our best to rely on ourselves but come up short, a major obstacle would be cleared. While pleased to learn about this 13th C. Charter of the Forest, and while relatively ignorant in the history of UK laws, I wonder if Professor van Bueren’s summary is quite as candid as as it might be? The few Forest ‘rights’ mentioned have nothing do with anyone’s duty to supply food to persons and everything to do with an ancient and once burning issue that can be summarised as glanage -not to be barred from gathering what nature offers generally. This may include picking up fallen or forgotten crops (a Tractate of both Babylonian and Jerusalem Talmuds deals with this ‘gleaning’), or may be limited to ‘state of nature’ goods. It may include fishing and taking animals such as wildfowl or deer. What it is not, is taking goods from party A to give to party B on the basis of disparate wealth between the parties, which is what welfare-state fiscal policy does. If you consider picking up firewood in the forest a basis for taxing one household A at 30% in order to give commercial agricultural produce free to household B, fine. Ii don’t consider it fit or even safe use of history. No value judgments as to how to feed hungry people are proposed here -merely a try at clarity. I HAVE WORKED ALL OF MY WORKING LIFE…I had to give up my two jobs due to becoming very ill eventually was given the major operation I needed..(used what little savings I did have).I have been treated disgracefully from MY GOVERNMENT…I am a Mother on her own… was given no support and had to rely on a food bank when they stopped what little payment I was receiving…my Mother and Father have had to help me…the way I have been treated I am now suffering from anxiety and depression to add insult to injury and my recovery from operation has been put back immensely…I A PERSON WHO JUST WANTED TO REGAIN MY STRENGTH TO RETURN TO WORK HAVE THEREFORE BEEN UNABLE TO AS YET…one year since operation…ALTHOUGH I FEEL I AM ONE OF THE LUCKY ONE’S …that my parents were in a position to help us…my Mum is now retired and my Dad retires soon…GOD ONLY KNOWS WHAT I WOULD HAVE DONE WITHOUT MY FAMILY…I WAS SUICIDAL WITH ALL THIS A FEW MTHS AGO…disillusioned with my own country…WHY DID I PAY MY CONTRIBUTIONS IN ALL OF MY WRKN LIFE TO BE TREATED SUCH AS THIS can perhaps MY PRIME MINISTER EXPLAIN TO ME and MY CHILDREN WHY their once strong, fit, active and fun Mother has been taken away! There are thousands of people in this country who go hungry and it could run into millions. To have an idea that someone can be unemployed but receive benefit is sheer fantasy. I feel like having to take the hands and walk people along the streets like the story of scrooge and christmas past. Every day people are denied a jobseekers allowance or made to wait for months on the most flimsy of excuses by the DWP. These people are often single and young and make up a large percentage. Those having children may receive more help but with all costs rising such as basic electricity and gas charges etc the budget is squeezed. The minimum wage for those working does little to help pay the way. The UK also has little protection for the lowest paid workforces and contracts are left to the employing company. While they are people who waste money, to take that argument for writing off others hunger is like taking away half the countries children in the panic to protect the few who are suffering serious risks and death. There is no justification for blanket coverage. My husband and I are both pensioners and there are 3 of us in the household. We stopped putting food in food banks when we discovered that another household of 3 who had a higher joint income than we did were able to obtain food from food banks just because they had a benefit that we did not. So how many others are there that also cannot claim free food? How many others who do not drink or smoke? How many others who have forgotten what going out means unless it is sitting on a bench somewhere or a visit to friends/family? Alice Why should everyone suffer because of the few? I can see what you mean but there are greedy people at every stage in life ,even millionares. It’s so obvious why our government wants to leave the HR convention or whatever it’s called. We’ve all moaned long enough about the EU interfering in our business – myself included but only because even a few years ago if someone told me that they were being left with no social security at all my response would be of disbelief or privately thinking they must’ve done something to cause that whilst I would’ve said, “They can’t do that surely?!”. Now, with the new rules about mandatory reconsideration here, I know first hand that they most certainly CAN, and WILL, do that! I don;t know how we will stop this cruel government – I think most are looking to the EU or UN for salvation but to me it’s like we have a cruel and inhumane dictatorship ruling us who will literally stop at nothing. It frightens me because I believe these cruel and inhumane welfare changes are just the tip of the iceberg and they are going to wait and see if they can retain power next time and if they do, God help us all! I wouldn’t be at all surprised if soon we will start seeing massive national social unrest of the worst kind although personally i would prefer it if everyone protested in a quiet manner, such as simply cease paying the bedroon tax, council tax and their utilities entirely until these things were scrapped all together (for the 1st two) or reduced significantly in price. I seriously doubt anyone truly goes hungry in the UK though I am quite sure many are malnourished due to more pressing needs such as the latest mobile phone, bingo, booze, fags, drugs, prime meat for dogs, etc. technically I am below the pverty line yet I eat steak and salmon every week and lots of healthy fruit and veg every day. What is lacking is not food banks for the unscrupulous and stupid but brain and personal responsibility banks. Thank God someone is looking further into this aspect of it. With a limited understanding of International Law, and how it applies to this situation, I nevertheless have been trying to spread information obtained from the pages of the UN Special Rapporteur on The Right To Food, Olivier de Schutter, hoping that someone would be able to take it further. And now with what you have stated here relating to the The Charter of The Forest, together with what the UN has said on the matter, I do hope someone from the legal profession will now pursue something along those lines. I cannot believe the government can continue to get away with using foodbanks to replace a government’s responsibility for providing the social security net all governments should. The following is what I have gathered ,and what seems relevant to the situation we are in, from Mr Schutter’s pages…. And the one we should take note of moreso and which definitely applies to the government during these past few years being this one….noting the requirement “to ensure that wage policies or social safety nets” are in place. Even if such a right exists I doubt the poorest in out society have the means or opportunity to really enforce it. In reality the solutionto poverty is political not legal, although legal principles can add to the political debate. However, I would be happy to see a successful case. Would certainly put the cat amongst the pigeons, but would likely confirm in the minds of the hysterical Right that it would be best to withdraw from all HR obligations.